Probably the most common purpose of prototypes is to receive feedback from different stakeholders. 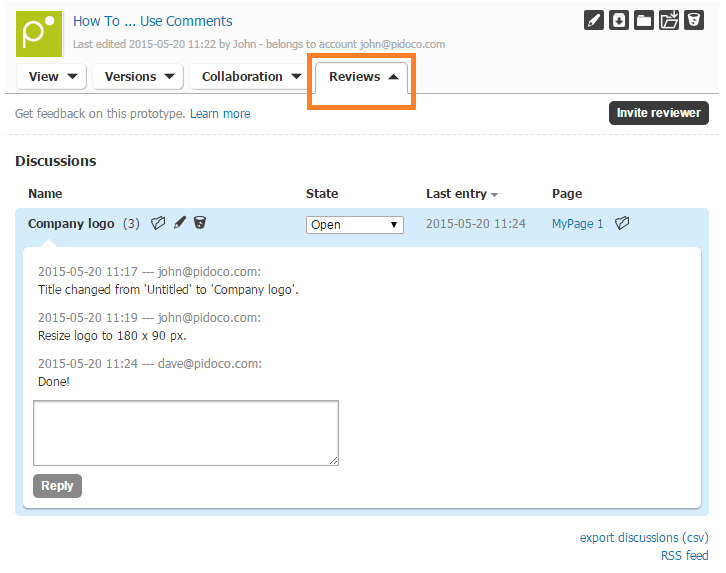 Pidoco gives you an easy way to do so: You can share your prototypes for reviewing and thereby allow others to comment on them. This is easily done by placing a little marker on any part of a page in the Simulation View and posting a message into the provided text field. Other reviewers can respond to any comment, thereby creating a discussion. Discussions are a great way to keep track of change requests and to document decision-making processes. Every discussion can have a custom title, which you can change by double-clicking on it. To keep track of new feedback, each discussion also has a status that can be changed when feedback has been incorporated into the next iterations of the prototype. To do so, simply click on the status field in the toolbar of the discussion and select the desired option. Note: Only people with “Review” or “Collaborate” rights can create and participate in a discussion. Collaborators with full access to a prototype can also use the “Reviews” tab in My Prototypes to quickly check for new feedback and reply to a discussion thread. A click on the respective discussion will open the dialog and let you post a comment. Additionally, a click on the link in the “Page” column lets you jump right into the page to which the discussion refers. Hint: Discussions can be exported for use in other tools or turned directly into issue tickets via our integration with Planio, a web-based project management tool, or JIRA (Enterprise Edition only). An RSS feed will keep you up-to-date on new incoming comments. 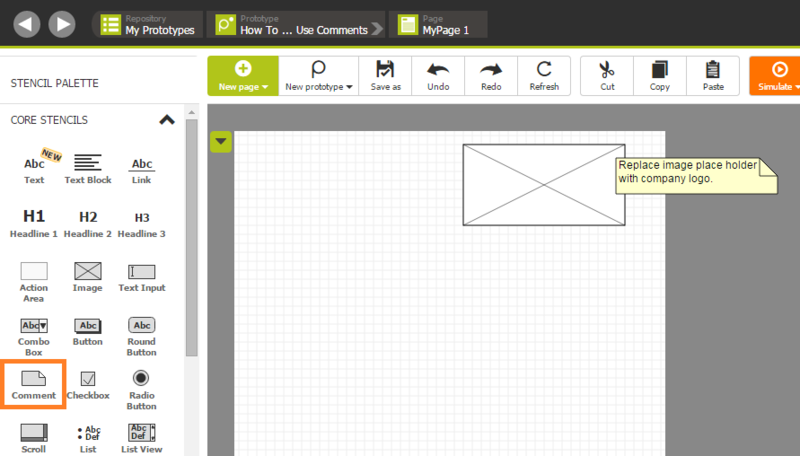 The Comment stencil can be used to add notes or explanations to your prototype that by default are visible to any viewer, for example to add information where the prototype lacks detail. Another reason to use the comment stencil could be to quickly jot down an idea or add a reminder for an open issue to be solved later on. Yet another use case might be to leave a note to fellow collaborators, e.g. “This page is not finished yet”. The Comment stencil works just like all the other stencils. To use it, simply drag it from the Stencil Palette to the desired position and enter your text. The Comment stencil also offers you a choice of colors so you color code notes for different audiences. If desired, you can hide individual comments in simulation mode via a checkbox in the Context Menu. Prototypes can serve as blueprints for development. Usually, the developers need more information than just what the UI will look like. 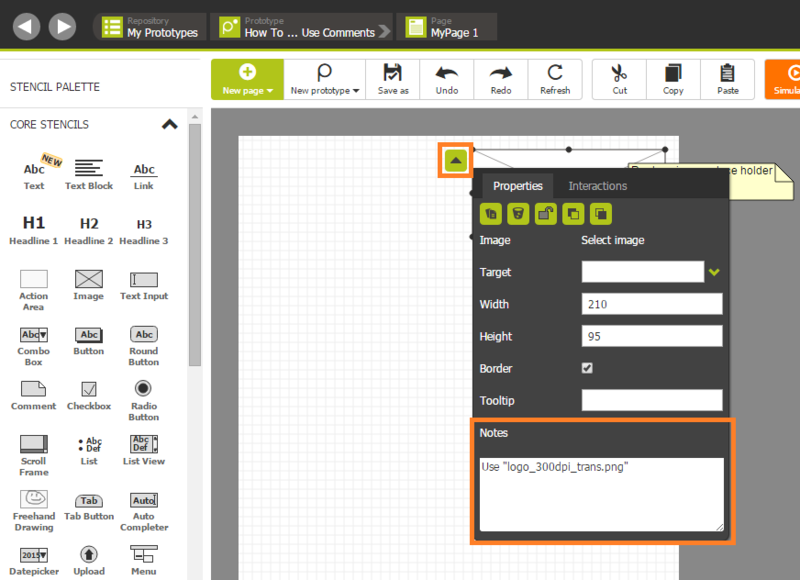 That is why Pidoco allows you to add annotations to any element of your prototype. Annotations are invisible in simulation mode, so you can use them to provide detailed information, functional requirements, or instructions to your programmers without letting everyone else see them or distracting from the prototype itself. If you want to use the specification document export to brief your development team, you can choose to include the annotations when generating it. To add annotations to any element, open the Context Menu of the respective element and enter your text in the “Notes” field. That’s it! You have successfully added comments and notes to your prototype! Do you need help working with comments? Then do not hesitate and drop us a line via support@pidoco.com or Facebook and Twitter.